Sample preparation prior to analysis is critical and directly impacts the quality of the characterization. From the nature of the technique, specimens have to be clean and dry prior to analysis, to ensure proper imaging and reliable analysis. Use of gloves to manipulate samples is mandatory during all steps of specimen cleaning, mounting and loading into the microscope. Both types of SEM mounts can be purchased from Ted Pella, Inc. (items #16324 and#16111), SPI Supplies (items #Z01576 and #01506) or Electron Microscopy Sciences (items #75621 and #75170). These basic mounts are inexpensive and will be suitable for the vast majority of specimens. For larger samples or samples with odd shapes, many specialized mounts are available from the three suppliers previously listed. Typically, a new EMC user will be given a couple basic SEM mounts on the first training session, and they can be re-used many times. However, it is recommended to purchase more mounts to be able to store critical specimens without having to un-mount them after each session. The EMC has several particular mounts and holders (wider, with clamps or pre-tilted) that users can borrow. Please, do not hesitate to ask about these mounts. Securing a sample onto the SEM mount is another important part of the sample preparation. Typically, an electrically conductive carbon double sided tape is placed onto the mount and the sample is gently pressed onto the surface. Another method is to use a conductive paint (carbon or silver) to attach the specimen. this technique is particularly useful for fragile samples and can also be used to “wrap” non conductive specimens. Always let the paint fully dry before loading the sample in the microscope. Typically, 30 minutes is long enough for the solvents to evaporate, hence preventing chamber contamination and imaging issues. Conductive tapes and paints can be purchased from all three vendors listed above (item #16084-3, #16034 and #16051 from Ted Pella, Inc. are good choices). User can use tapes and paints at the EMC to prepare their samples, with help from our staff. However, this preparation needs to be done before scheduled instrument time (please, plan ahead of time). TEMs typically have special holders requiring very small sample size and a specific geometry. Specimens need to fit on a 3 mm diameter grid only a couple tens of micrometers thick. Sample preparation is minimal for powders/particles (sonication followed by drying on a TEM grid) but extensive for bulk specimens. Specific equipment for TEM sample preparation is available at the EMC (ultrasonic disc cutter, dimpler, precision ion polishing). 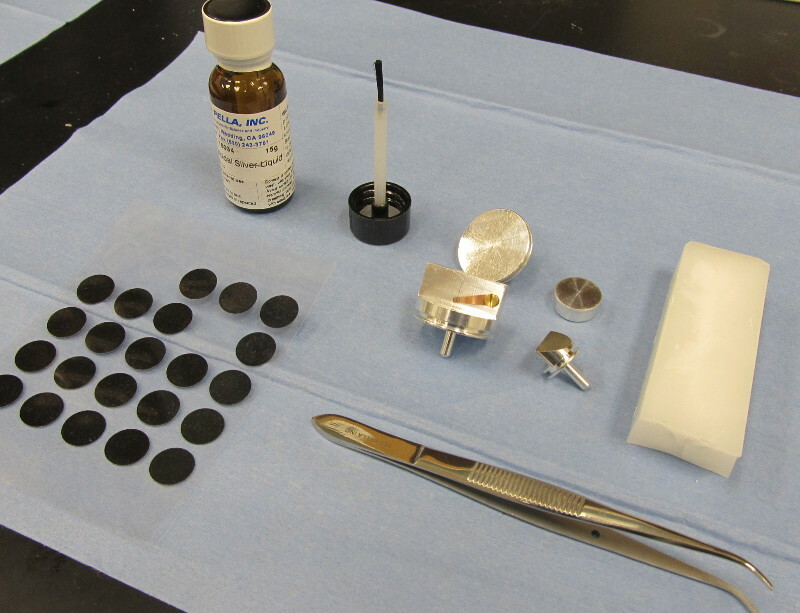 In addition, TEM specimens from specific locations on samples can be prepared in-situ using the focused ion beam. Users should contact the EMC staff to discuss TEM sample preparation techniques and for training/help to the equipment. TEM grids (copper grids are a good choice, for example Ted Pella, Inc. items #1GC150 or #1GC400).